Bayreuth (in northern Bavaria,) is on the Red Main river in a valley between the Frankish Alb and the Fichtelgebirge mountain ranges. It has a population of 73,048 with a size of 25.8 sq mi (66.92 km².) Its coat of arms is on the left. 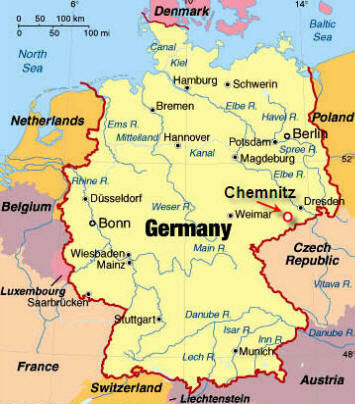 It is the capital of Oberfranken or Upper Franconia (brown area in the map of Bavaria, right.) With Middle and Lower Franconia, it makes up the old region of Franconia. With a population of more than one million and more than 200 independent breweries which brew approximately 1000 different types of beer, Upper Franconia has the highest rate of breweries per capita in the world. There's also a special Franconia beer route (Fränkische Bräuereistraße) loosely connecting the many breweries. 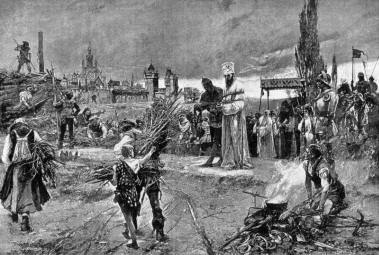 Jan Hus's last words are allegedly, "in a hundred years, God will raise up a man whose calls for reform cannot be suppressed." 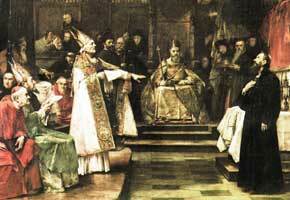 Martin Luther nailed his 95 Theses to a church door in Wittenberg 102 years later. 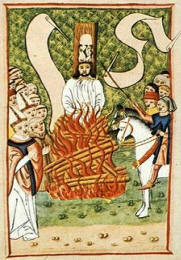 Interestingly, nearly 6 centuries later, in 1999, Pope John Paul II expressed "deep regret for the cruel death inflicted" on Hus and he went on to suggest an inquiry as to whether Hus might be cleared of heresy. 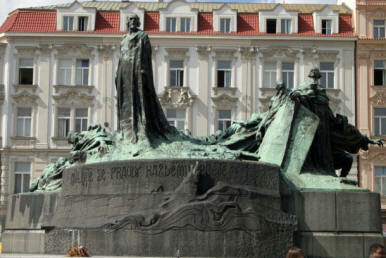 The Czechs erected a statue to him in Prague (above right.) It is a very interesting story. 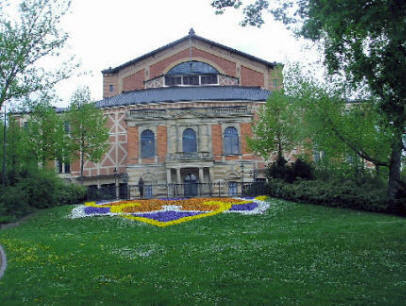 In the 1930s, Bayreuth became a scene of Nazi ideology, with Nazi leaders often attending the Wagner festival and trying to turn Bayreuth into a model Nazi town. 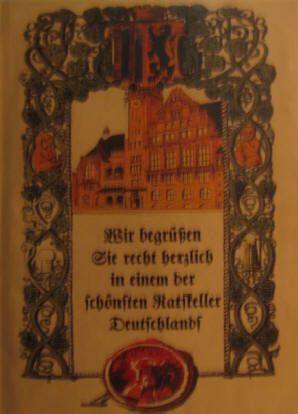 It was one of several cities in which town planning was administered directly from Berlin. Hitler loved Wagner's music, and was a close friend of Winifred Wagner after she took over the Bayreuth Festival. 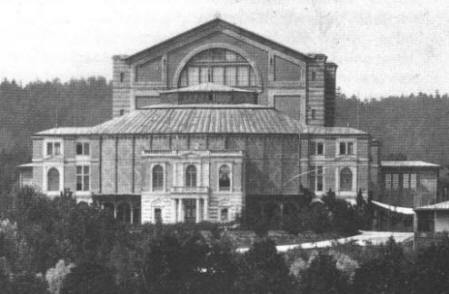 Hitler (above left) frequently attended Wagner performances in the Bayreuth Festspielhaus (above today.) To learn more and see and hear Wagner, click the link above. 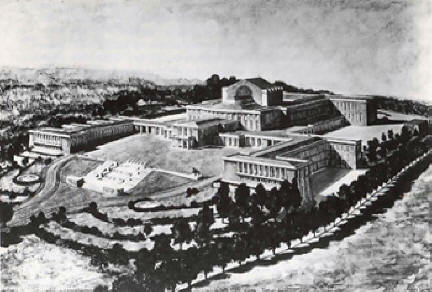 Below left is how it looked in 1882 and on the right was Hitler's grand plans to redo it. During World War II, a sub-camp of the Flossenburg concentration camp was located here. Bayreuth was heavily bombed at the end of the war and one third of the city was destroyed, killing about a thousand people. 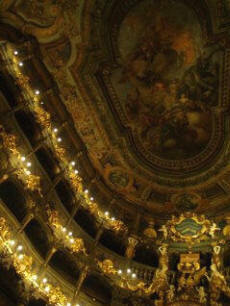 After the war, Bayreuth tried to part with its ill-fated past and the Wagner festival was restarted in 1951. 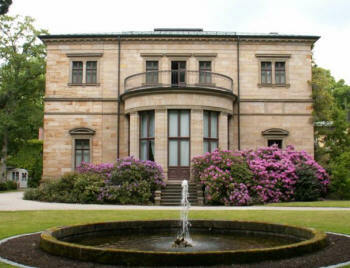 In 1975 the University of Bayreuth was founded and largely contributed to the further growth of the city. There's the background of where we are. This day celebrates our first week in Germany. I woke at 11:15 AM and got up at 12:15 which means my jetlag is really waning, but I still don't feel like writing diarios. As you can see, our room was nice if not huge. I got down to the street and got a shot of the hotel (below left) and of the Opera of the Margraves (Markgräfliches Opernhaus) right next door (below right.) Pretty good location, huh? 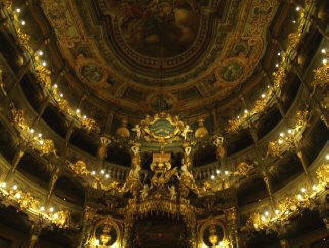 It was built from 1746-1750 on plans by Bibiena and Saint-Pierre. 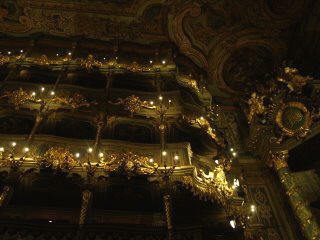 Here are some stock photos of the interior of the opera house. Below is the little cafe area outside the hotel nearby, which was very convenient. At 12:45 I was on my run to the Bahnhof (train station) and at 1 PM came across a place called Gebers which had an outdoor sale on pillows. I ran in a bought 2 pillows for €10 and continued running. We can use them in the car or in the room if the ones provided aren't very good. I continued my run carrying the pillows. I finally got to the Bayreuth Hauptbahnhof (main train station) and ran inside. Below left, one more of the interior of the opera house and a sign showing the city's sister cities. I went out the backside where the tracks are. It was very nicely done. As I kept running I came across a bridge over the city's major river, the Roter Main (Red Main.) It was hard to tell it was a river. It looked more like a drain. Next to it is a better stock photo of the river. As I got back into the city I was stopped in my tracks by this comical display on the building. I had to admit that it was cute and certainly unusual for the staid Germans. Doesn't this look like American graffiti? I got back to the hotel and at 3 PM Maja helped us check out of the hotel which was a little more expensive than the night before. Below left is there cute little courtyard in the back. We then headed out to explore the city and as I walked along I came across this photographers window. As meandering can take you, I took photos of a lot of the architecture in the city. Below is a pretty fountain and a memorial to the two world wars. Below is a shot of the Altes Rathaus (old city hall) on the left and the Neues Rathaus (new city hall) on the right. I like the old one. Above is the Bayerischer Hof Hotel. I finally reached this very large building which was just huge. 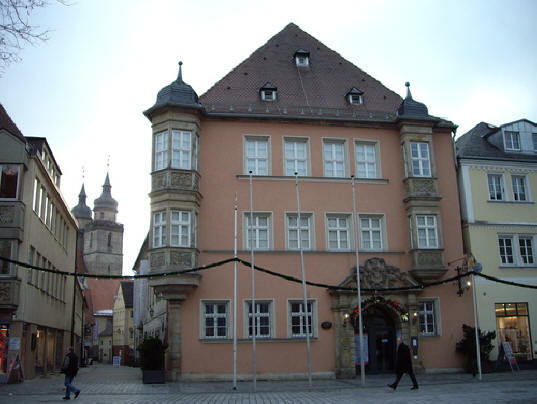 It is the Old Palace (Altes Schloss.) It is a huge, four winged complex that date's back to the 13th Century. 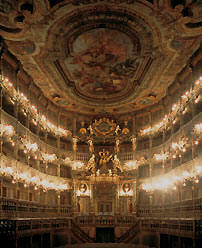 It was re-designed in the 16th and 17th Centuries, and rebuilt in the 1950's after being damaged in WWII. The Schloss stands out, as it is painted white, with rust color trimming's. It is here, in the Palace Church, that the Royal crypt stands, containing the sarcophaguses of the Margrave Friedrich and Margravine Wilhelmine. There is no way to stand back far enough to get it all in in one shot, so below is the PhotoStitch compilation so ignore the bends in the building. In the courtyard is the statue of Maximilian II, King of Bavaria. Looking a little closer, above left, there are circular figures above each of the windows. Here are just a few examples. I don't know whether these are famous people or not but they were all different. At 3:15 Marcia had lunch at Louis' Bistro [Ludwigstrasse 1, +49-921-786-6866.] She had a pizza and I had a cappuccino and opened my computer and did AOL email and downloaded Rush. At 5:10 I bought a camera bag at Photomarkt for sale at €10 and then went into a Bäkerei and got 2 diet-cokes, water and pretzels. The following are photos of various areas in the city to give you a feel of the place. Above right is the Altes Rathaus with the patio restaurant going full blast. Can you spot the McDonalds on the left photo below? Then I came across an outdoor farmer's market with this tall "totem pole" with a ring wreath at the top. I didn't know what it represented until I studied the signs on it. The farmer's market was full of wonderful fruits and vegetables. This is white asparagus (spargel) season and they're selling for €3/lb while wassermelonen (watermelons) sell for €1/lb. Since Germany is famous for its meat products, I had to get some photos of these beautiful displays in the Fleischer shop windows. On the right below you can see all the various wursts they have. Here is a huge display of various salamis and bolognas. Wagner created the story of the Ring by fusing elements from many German and Scandinavian myths and folk tales. The Old Norse Eddas supplied much of the material for Das Rheingold. The plot revolves around a magic ring that grants the power to rule the world, forged by the Nibelung dwarf Alberich from gold stolen from the river Rhine. Several mythic figures struggle for possession of the Ring, including Wotan (Odin), the chief of the gods. Wotan's scheme, spanning generations, to overcome his limitations, drives much of the action in the story. The hero Siegfried wins the Ring, as Wotan intended, but is eventually betrayed and slain. Finally, the Valkyrie Brünnhilde, Siegfried's lover and Wotan's estranged daughter, returns the Ring to the Rhine. In the process, the Gods are destroyed. Wagner's life was quite tumultuous and debt-ridden. Without the support of Bavarian King Ludwig II (left,) he would never had made it. 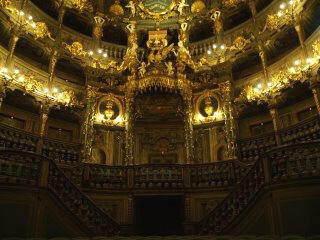 It was Ludwig that helped pay for the opera house where his operas would be staged by him. When Wagner married his second wife it made him a son-in-law of Franz Liszt (right.) 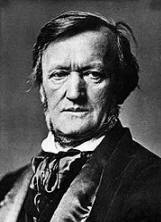 Wagner's strong and published anti-semitism leads many to believe he was an inspiration for that of Hitler's. No Wagner opera has ever been staged in Israel. It is interesting that the only opera Marcia and I have ever attended was one by Wagner staged in the beautiful opera house in Budapest in 1997. I didn't understand a thing especially since the electronic translator overhead was in Hungarian. In the courtyard is a tribute to Richard Wagner. Well, enough for operas. It was starting to get late and time to move on and leave Bavaria and head north to Saxony. 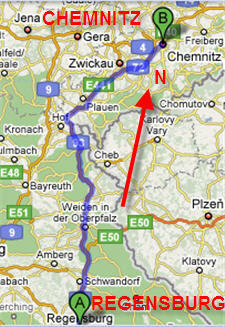 At 5:45, Marcia drove the 95 miles from Bayreuth to Chemnitz. We are now entering the real East Germany in the region called Saxony. After an hour into the trip, at 6:40, a very heavy rain storm ensued making driving difficult. This is the beginning of the worst weather we have had during the summer on all of our seven trips. 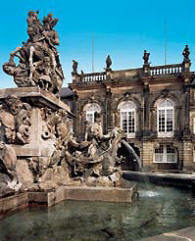 I had chosen and booked a hotel in Chemnitz called the Schlosshotel in Klaffenbach [ +49-371-2-6110.] We arrived there in the pouring rain at 7:45 and the first thing I notice is that it is huge and no where near the city center. Then it appears that there is some big event going on and its some kind of golf club. I felt I had made a booking mistake here, which is rare but on these trips, I don't compromise. We arrived in the Zentrum (center) and wended our way through the streets and found our hotel. At 8 PM we checked into the Mercure Hotel Kongress Chemnitz (Rm #1918) [Brückenstraße 19, +49-371-6830] and unpacked our bags. The room was comfortable with plenty of room. The Palm phone charging is not plugged in yet. That's what I record the Diarios with. I do this hookup as soon as I get into the room and it is the last thing I pack before we leave. We then went downstairs to the hotel bar to have our mandatory Accor "welcome cocktail." Marcia had a weissewine and I had a stein of Warsteiner, which is a common beer throughout Germany. The hotel was originally built by the East German communist government and when Accor got it they did a whole refurbishment. It is the tallest building in the city. It is a 3-star Kongress hotel mainly for meetings. The whole lobby is dedicated to a museum of automobiles and motorcycles. I never figured out why. After looking at all the displays, at 9:20 we took a cab to find the restaurant recommended to us by the hotel. 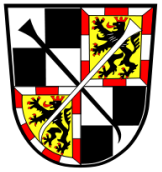 At 9:30 we found the the Ratskeller Chemnitz [Markt 1, +49-371-694-9875.] First you climb down the stairs under the "Hearty Welcome" sign and then enter the dining hall. 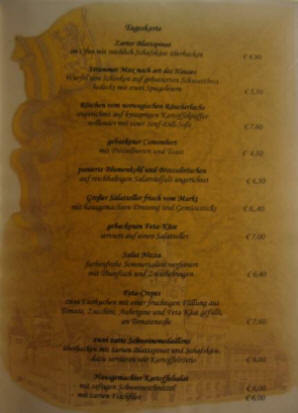 Here was the menu for the Ratskeller, our first example of the old East Germany. We sat down at a nice table against the wall and and after the waiter saw me taking pictures, he took this one of us. 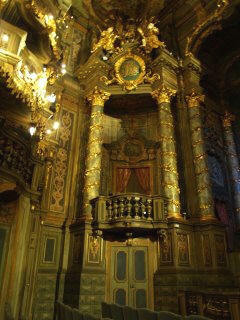 Below are the gold-encrusted carvings on the columns. The first is of a dragon threatening this guy whose neck is encircled by a snake. On the left, a man riding a snail backwards and on the right a guy being squeezed by a wine press with a load of something coming out his backside. On the left (below) is a man with a toothache and the other, a musician writing. There were many more but I decided not to photograph all of them. Since Germany is about beer, it is important for me to try as many different types as I can. This is a task I am up to, since I began this endeavor when I was 13 years old in Troy, New York. I first had a Radeberger pils (below left) with my goulash followed by an Einsiedler Landbier (below right) during my entree. Both were very good. My dinner consisted of a goulash soup with kidney beans to start and then a beef sauerbraten with red cabbage and potato pancakes. I learned that "creme fraich" here means plain sour cream. This was all very good. Marcia enjoyed the chardonnay she ordered and the two seltzerwassers. For an appetizer she had tomaten salat (tomato salad) with feta cheese, lettuce and a radish (I had to eat the radish.) For dinner she had her favorite, Wildlachs vom rost (roasted salmon) with weiss spargle (white asparagus) and Kartoffeln (potato) fritter sticks. She said it was pretty good. Not bad for a total of €50 for both of us for everything. After dinner we toured the keller and took some photos and at 11 PM we left and walked back to the hotel. At 11:30, I had two cappuccinos at the hotel bar and worked on the maps trying to lay out the rest of the trip through Saxony and East Germany. I have to plan the right scheme to get to Roma in time for Kevin's wedding. I went to bed at 2 AM.